“Oh, Steve. I hope our hair is always this fabulous!” in the “Days of Our Lives” spoilers. “Days of Our Lives” spoilers for Thursday, February 16th, predict that Stayla finally ties the knot, but not all of Salem’s residents have such a great day. 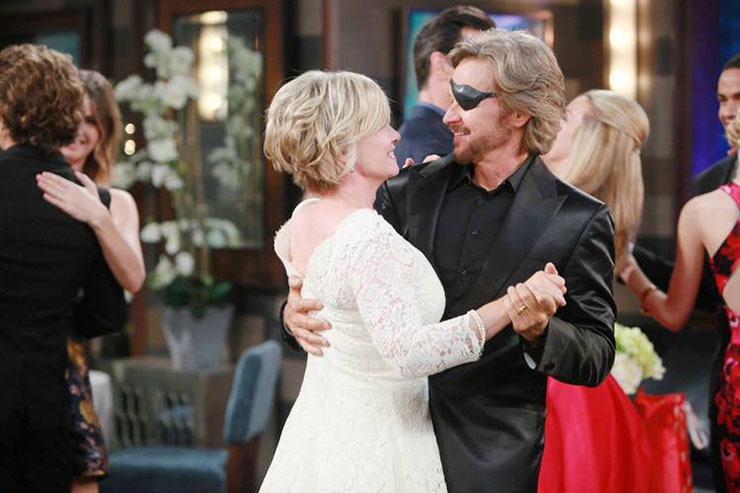 OK, so Kayla (Mary Beth Evans) didn’t put Steve’s (Stephen Nichols) patch on his eye as a sign of their commitment. But that pun has just been going through our minds at Soap Cities, and we had to use it! Anyhow, it’s the day so many of us, not the least of whom are Steve and Kayla, have been waiting for. These two finally say, “I Do,”–again–in front of their beaming family and friends. This is a soap wedding, people, so there will likely at least be a surprise of some sort (hint: there definitely will), if not a disaster. Luckily, Steve and Kayla have proven they can withstand anything and be the stronger for it. Theo (Kyler Pettis) takes the amorous opportunity afforded by Valentine’s Day to give his plus-one, Claire (Olivia Rose Keegan) a present. Perhaps this sweet overture will help Claire realize she should stop trying to manipulate Theo all the time. Then again, her roomie and BFF Ciara is likely to be jealous and crestfallen as usual, so this could make things more complicated for her and the young Mr. Carver. Meanwhile, Anna (Leann Hunley) makes a potentially dangerous move. She takes on her ex-brother-in-law, Andre (Thaao Penghlis). Now, we know Anna, whom we love, is not always functioning with the fullest set of marbles. However, even she should know that doing this could be a life-threatening move. Then again, what fun would that be? The Orwell Device drama is reaching its frenzied climax these days. Thursday Sonny (Freddie Smith) gets abducted by Andre’s goon. Stay tuned to see how Sonny fares. This could be the fight of his life, literally!